My mom is kind of a rock star. This isn’t something I’ve ever really thought about, mostly because she and I are so completely different. And not different in the “opposites attract” way. It’s more like different in the she’s-a-member-of-the-Rosary-Society-and-I-am-the-Devil-Incarnate way. Still, given that I am in the middle of a quarter-life crisis (Look! It’s for reals! ), I’ve been getting mad nostalgic and existential up in this crib. 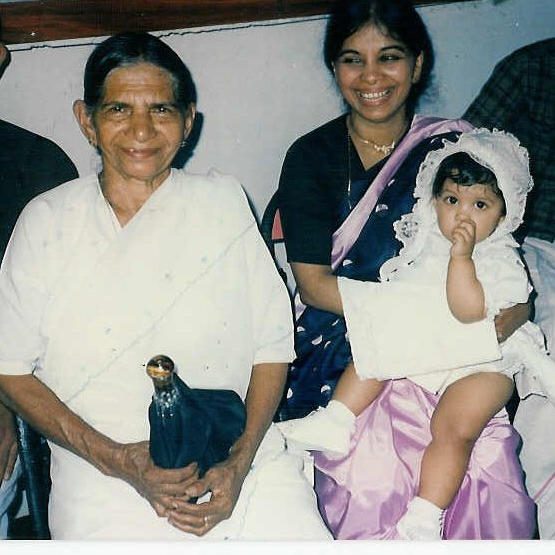 Mom left her home in India in her teens to attend nursing school in Heidelberg, Germany. The woman did not speak a lick of German, or English, or anything but Malayalam, and she was all alone. Within six months, she was fluent in the Deutsch and at the top of her class. By the time she was my age, she was already married to my dad and was an established registered nurse. Pretty amazing, right? As I said, I really don’t think about how difficult her teens and twenties must have been, mostly because I am probably very self-centered and am trying to figure my own $&#% out. This is a photo taken at my baptism in Kerala, India. What a little chubster I was, right? Mom had to lug me around quite a bit. She says that I was the little cherub (she uses a different word, whatever) who caused her carpal-tunnel syndrome. Haters gonna hate. Anyway, both my mom and late grandma are/were beautiful ladies. Mama, you might be the saint to my sinner, but I love you and owe you more than muffins. 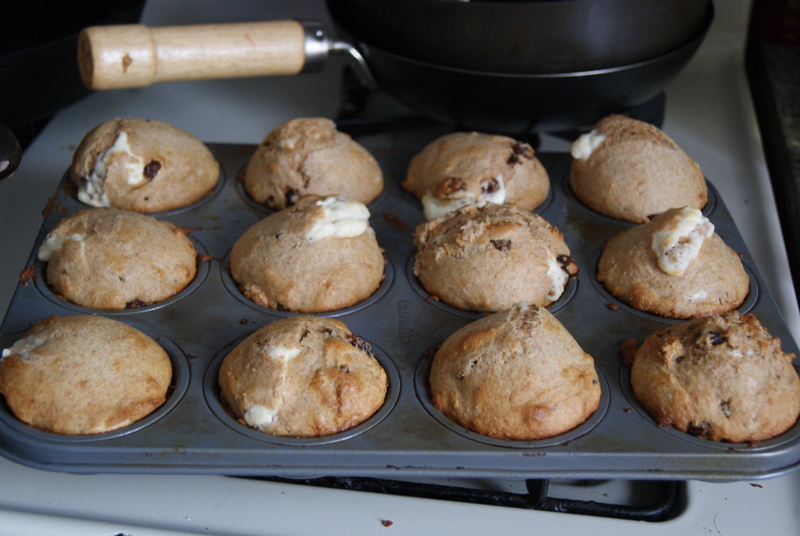 But you really like muffins so I made you some. Preheat the oven to 425°F and grease a 12-cup muffin tin. In a small bowl, combine the cheese, honey, zest and 1/4 teaspoon of vanilla. In a separate bowl, sift together the flour, baking powder, baking soda and salt. In a third bowl, beat your eggs and egg white , then whisk in the sugar and remaining vanilla. Add in the buttermilk and oil, then add the entire mixture to the flour mix. Finally, fold in your raisins. 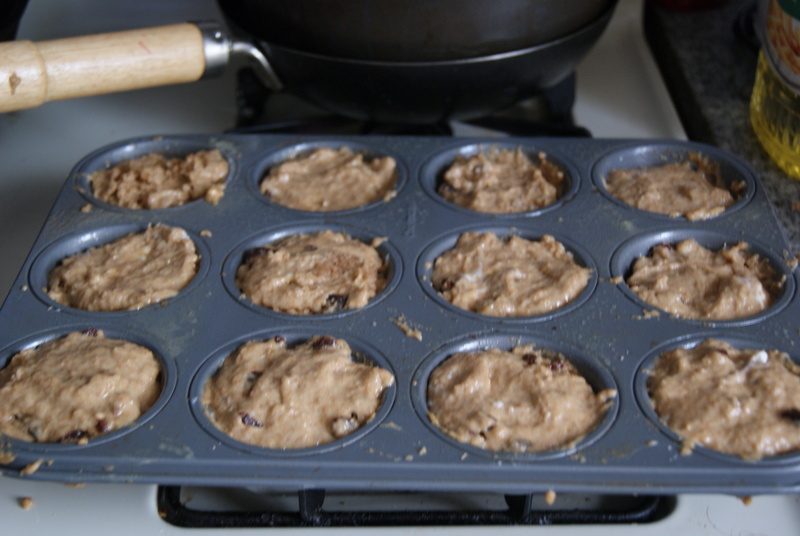 Spoon half of the mixture into each muffin cup. Drop about a teaspoon of your cheese mixture into the center of each cup, then cover each cup with your remaining batter. Sprinkle the tops with brown sugar if you so please. Pop these into the oven for 13 to 15 minutes, until the tops are slightly browned and spring back when touched. Want to know how I figured out mine were done? They sort of exploded. See? We all make mistakes. When those mistakes involve honeyed cheese oozing out of otherwise-perfect muffins, I will take them. Hopefully Mama will too. Actually, she doesn’t have a choice. Deal with it, lady. Happy Babymomma Day, Momma. Thanks for carrying my fat behind around for all those years.